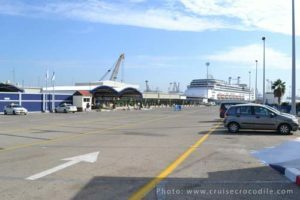 Our Haifa cruise port guide gives you information about the docking location, cruise dock, transportation options and much more! 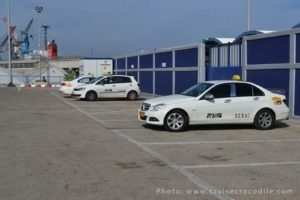 Welcome to the Haifa cruise port guide. There is a famous saying that goes: “In Tel Aviv they dance, in Jerusalem they pray, but in Haifa we work.” Haifa is the 3rd largest city in Israel with 300.000 inhabitants. It is the centre of international trade and operates the most important port of the country. The city of Haifa is not the best destination in Israel although the Baha’i Gardens are absolutely magnificent. We do, however, recommend you to go a little further afield and visit the amazing places like Acre, Nazareth, Yardenit or Caesarea. Find out how to get there in the Haifa cruise port guide underneath. 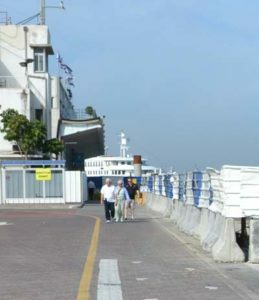 This is the Haifa cruise dock. Several ships can dock here. 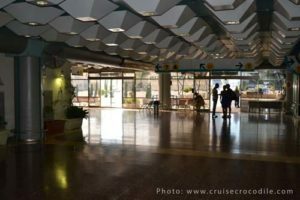 Everyone has to exit through the cruise terminal. Depending on where your ship will dock it is several hundred yard walk to the cruise terminal. Inside the Haifa cruise terminal you will find tourist information, taxi information, shops and free wi-fi. Via the walking bridge, also known as exit 5, just outside the cruise terminal you will walk straight into the city centre. Cruise ships dock at the port of Haifa. The Haifa cruise terminal is well equipped with tourist information, shops and free w-fi. The distance between the Haifa cruise port and city centre is about 1 mile or 15 minutes walk. You can also catch public bus 23 or a taxi to the city centre. The city is build on a hill so expect to do some uphill walking when exploring Haifa by foot. Haifa’s public transport system is pretty extensive. Take local bus 23 from the cruise port’s exit to the city centre and the Baha’i Gardens. The nearest bus stop is marked in the map above. You can also use Haifa’s metro system, which is the only one in the country. There is also a train service just outside the port area. You can also easily take the train from Haifa cruise port to Acre in just 30 minutes. Plan your trip on http://www.rail.co.il/EN/Pages/Homepage.aspx. 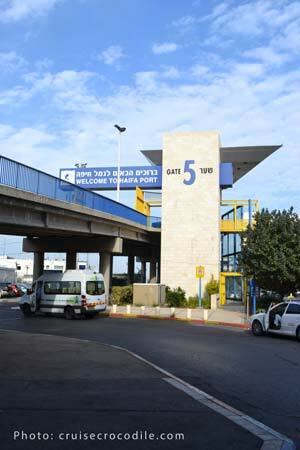 Please know the station closest to the Haifa cruise port is called Haifa Centre HoShmona. It is located right near the cruise terminal. See map above for exact location. The train station closest to Acre is Ako. The official currency of Israel is the Israeli New Shekel. Rule of thumb is 1 Shekel is 0,25 USD or 0,23 euro cents. Some shops will take US dollars or Euro and most shops takes creditcards. Acre – 26 km north of Haifa cruise port Nazareth – 50 km east of Haifa cruise port Yardenit – 75 km east of Haifa cruise port Caesarea – 44 km south of Haifa cruise port Essentials Official currency – Israeli new shekel Accepts Us dollars – are sometimes accepted Creditcards – are often accepted Drives on the – right Timezone – UTC +2 Israel Inhabitants – 8,2 million Official language – Hebrew and Arabic Capital city – Jerusalem State of Israel Government – Unitary parliamentary republic FAQ – Is there a chance the ship doesn’t go to Israel? Always, there is never a guarantee the ship is able to go although they will do their very best. – Is it safe in Israel? Generally the areas that you will visit are safe. If it wouldn’t be, the ship wouldn’t go there. – Is it better to go with an excursion? If you do go without excursion please know the city can be quite congested. It is better to go with a guide. You don’t necessarily need an excursion in Israel, but you are missing out on a lot of interesting information if you go without information. Make sure to bring a guide or book along. Visit Acre from Haifa cruise port. This historic walled city is one of the oldest continuously inhabited cities in the world. It dates back to 1504 BC (time of Pharaoh Thutmose III. There are lost of actions to visit in Acre like the the many historic walls and fortifications, Ahmed El-Jazzar Mosque, the old citadel and the underground Crusader city. Visit Nazareth from Haifa cruise port. Nazareth’s most famous site is the Church of Annunciation. It was build on the location where angel Gabriel announced the birth of Jesus to the virgin Mary. This is why Nazareth is considered the cradle of Christianity. Any fan of history has to take a guided tour through Caesarea. This town was build by Herod the Great, served as administrative centre of the province for the Roman Empire and would serve as capital of Byzantine Palestine. It was the most powerful trading post of the eastern Mediterranean. If you decide to stay in the town of Haifa you have to visit the The Bahá’í Gardens. These gardens, also known as the hanging gardens, are formed on the hills of Haifa. Members of the Bahai faith have established their shrine and world centre in the gardens. Take a few hours to explore the gardens and it’s 19 terraces. Cruise ships dock at the Haifa cruise terminal. From here it is an easy walk into the city center. Check out our full Haifa cruise port guide for all the information on this dock.